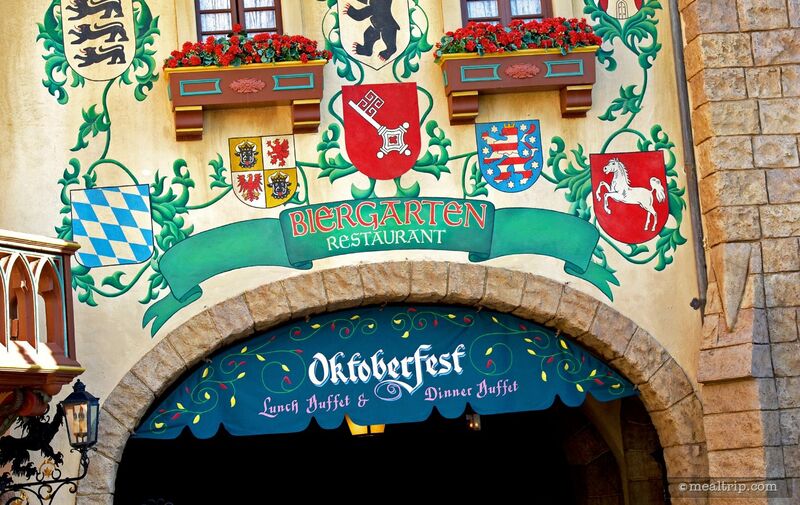 The Biergarten Restaurant offers all indoor seating, but was designed to make you feel like you’re in the middle of a traditional Bavarian village’s Octoberfest! Communal, biergarten-style tables fill a very large open area. It’s always twilight time, even at lunch, with street lights and even a moon peeking out over the horizon. There is no band at lunch, but that’s one of the small trade-offs for going during the less expensive lunch time. 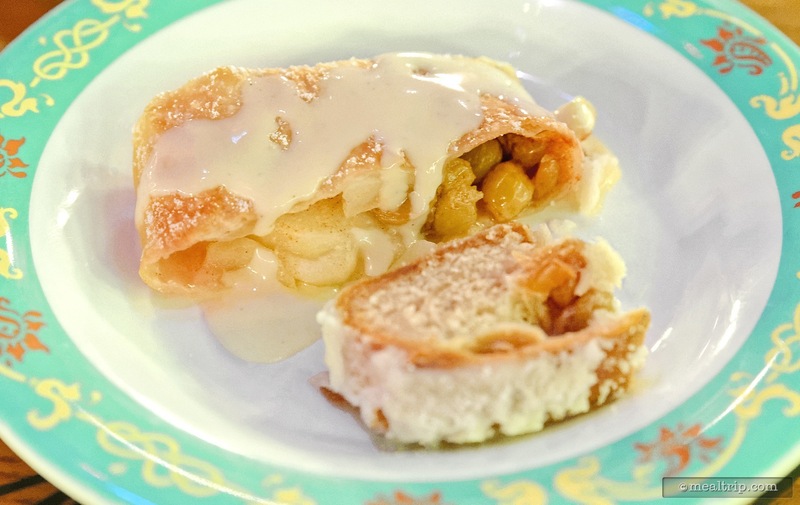 Rotating buffet selections such as bratwurst, rotisserie chicken, pork schnitzel, a variety of salads, and desserts include Bavarian cheesecake and hand-pulled apple strudel. 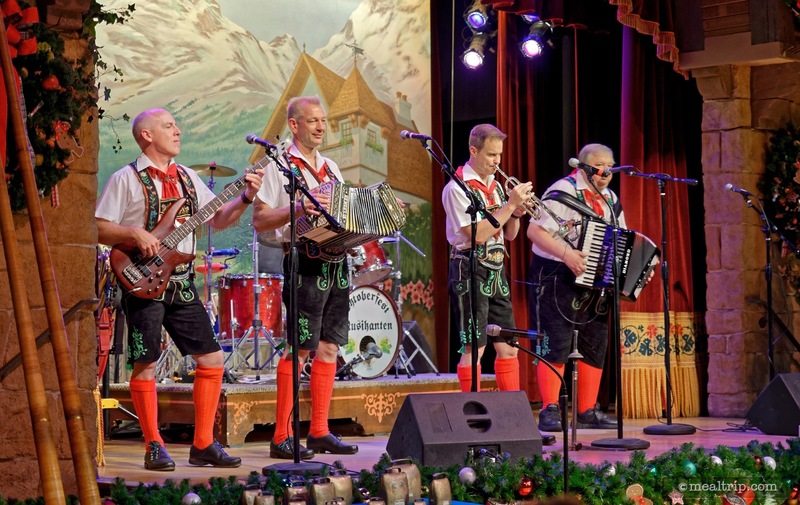 Standard beverages are included, while steins of German and domestic beer, and various wines are available for an additional fee. 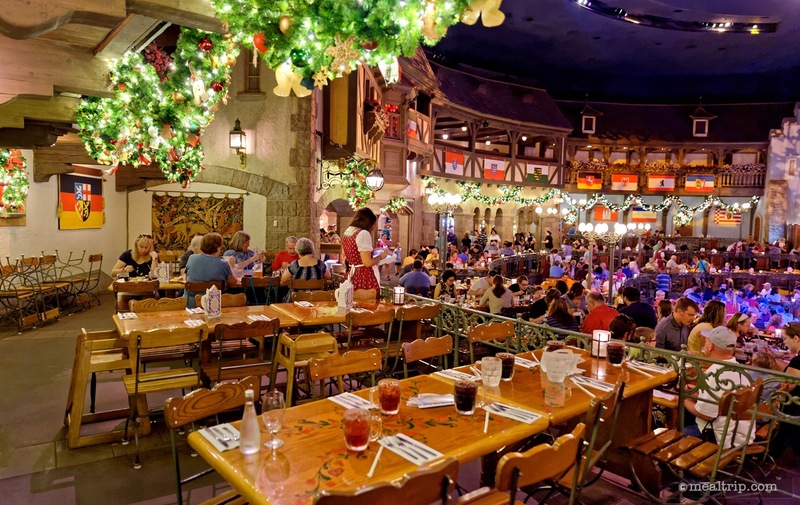 The Biergarten Restaurant is one of those locations where a giant indoor space, is intended to resemble an outdoor space at night, much like the San Angle Inn in the Mexico Pavilion (also at Epcot) or the Blue Bayou at Disneyland. For me though, it never seems to deliver that same "I can't stop looking around, how cool is this" kind of feeling that you get from those other locations. 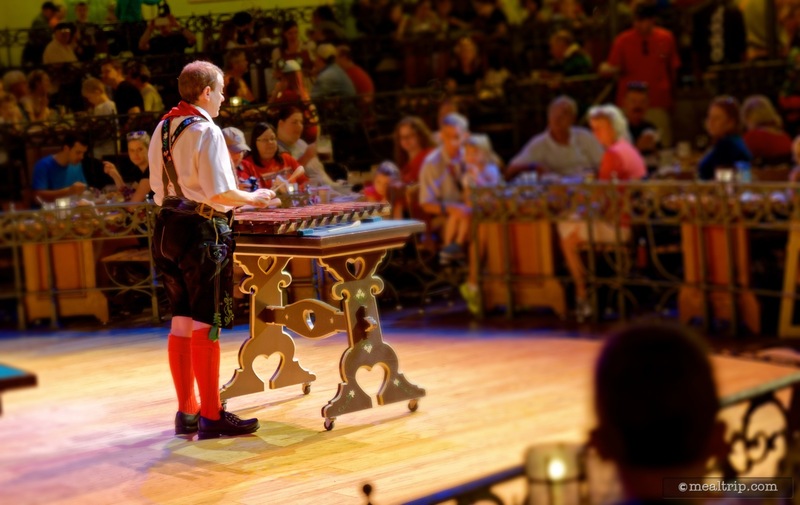 According to the backstory, the main dining area is set in a traditional Bavarian village during Oktoberfest, complete with an live oompah band (that doesn't start until one or two in the afternoon, so if you want to hear the band, don't go to lunch too early). There's something about the slightly tiered, semicircle layout of the communal tables and chairs, that makes me think I'm at a dinner theater getting ready to watch a local production of A Steetcar Named Desire. The layout seems to highlight the stage, and not the "outdoor" environment. The band probably has the best view in the house, with full unobstructed views of the building facades, trees and street lamps. The food here, has always been good, and I'll talk more about that in a bit. There's one more piece of information that I have to pass on first. Unless there are exactly eight people in your party… you will not have a table to yourself. This is sometimes refered to as communal seating or banquet style seating. Even with the place half empty, they will stack your table full of guest until there's eight, and then move on to the next table. It's not really a style of seating that I enjoy. Like most theme park dining locations, there's not much space. The chairs are tightly packed, and I usually end up sitting closer to a complete stranger than I would if I were sitting down on a bench outside. Every once in a while you get lucky, but more times than not… I end up sitting next to a sneezing four year old with chocolate sauce on his hands that keeps whacking you on the back, or the guy beside you that doesn't realize the hard thing he keeps ramming his chair into every time he gets up... is actually you, and not a pole. You just have to go with it… and enjoy being in the moment. There's never been a "problem" per say, and everyone seems to get to know one another by the end of the meal. That's part of the Oktoberfest spirit I suppose. 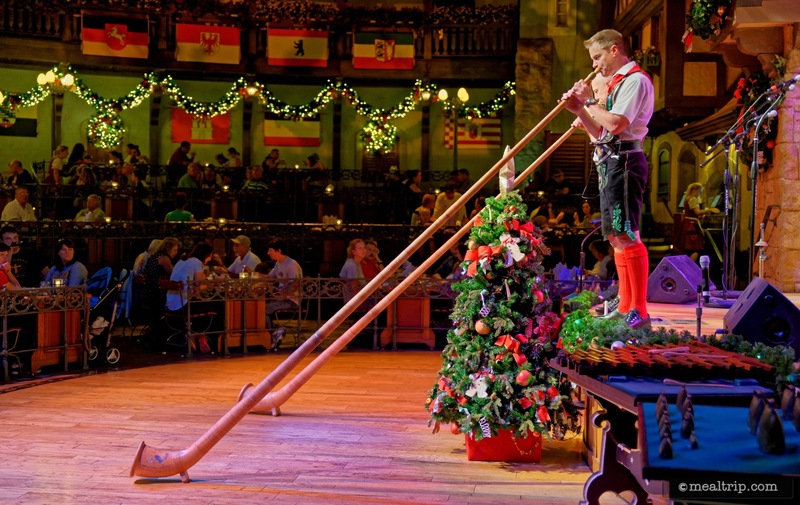 However, there is a difference between knocking back $2 steins at an actual Oktoberfest celebration in Germany... and having a $30-$60 per person meal in a theme park. On my most recent visit, I was taken to a table where another family had already been seated, and they were all away at the buffet. I'm not sure if the "communal table" concept was explained to them or not. When they came back with plates of food, there was no waiter or waitress around, no host or hostess… just me, sitting at their table, with all of their bags, purses and packages left about. We spent the next few minutes recreating a scene out of Goldilocks and the Three Bears, where I (unfortunately), played the part of the fair haired trespassing maiden. After I explained the whole concept to the best of my ability… everything seemed fine, even though I was looked at with a slightly suspicious eye the rest of the meal. In my mind, the patron... should not have to work so much. 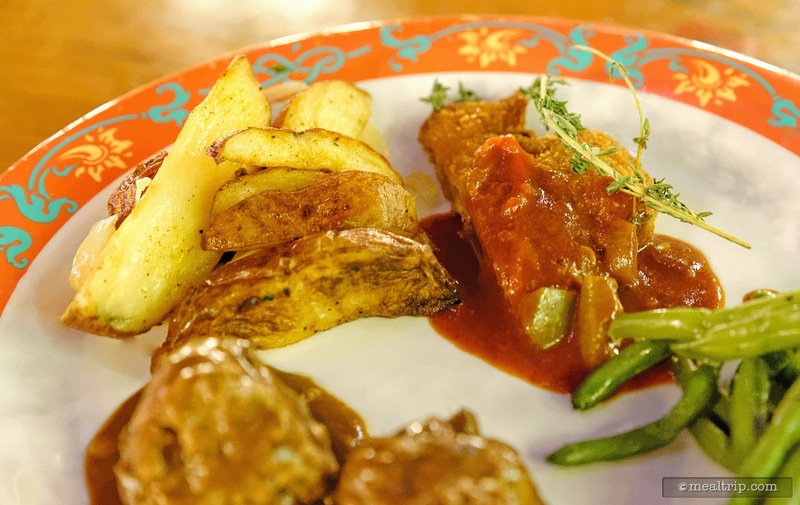 It's the promise of German cuisine and beer that draw guests to the location though, and in that department The Biergarten Restaurant seems to do quite well. There are usually at least four imported beers on tap. Selections like a Radeberger Pilsner, the Schofferhofer Weizen, Altenmunster's Oktoberfest, and a Hovels are common on the menu. You can get a beer flight (5 oz) of all four, a half liter, or a full liter of beer here. While a full liter will set you back $13, the spectacle alone is worth it. The liter of beer is delivered in a very large glass mug. 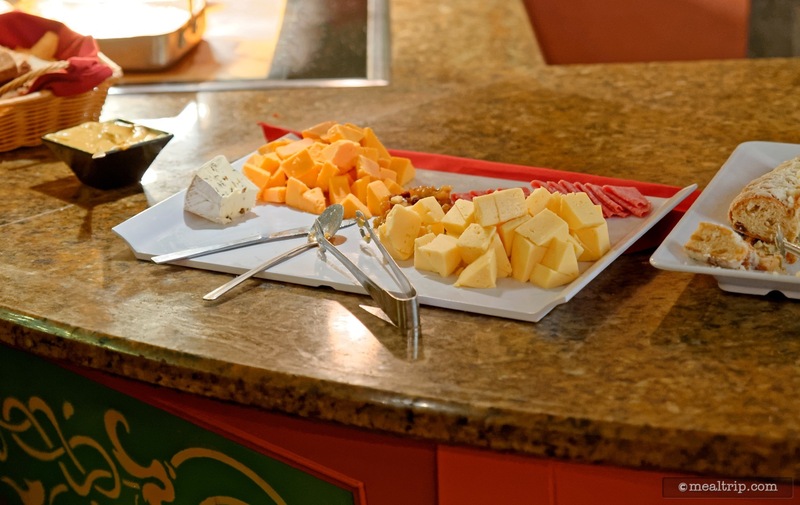 The buffet is split in two, with a main carving or "hot meat" station in the middle. Both sides are the same and guests seem to work their way from the outside in. Lines do get long at times but I've always found just going back to your seat for two or three minutes can make all the difference. It's not that the place is overcrowded. It just seems like everyone wants to get food at the same time. 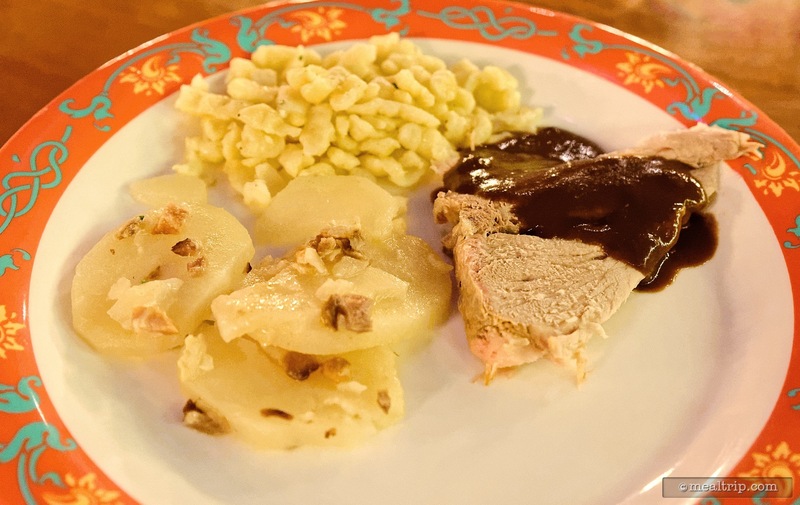 The fist station features cold items that include components to build your own salad, and a few more interesting German inspired prepared salads like cabbage salad, macaroni salad, and of course German potato salad. There are also usually some cold sliced meats and cheeses in this station. That first cold station gives way to a hot soup and bread station. The soup seems to change from day to day, so there's really no telling what you'll find there. 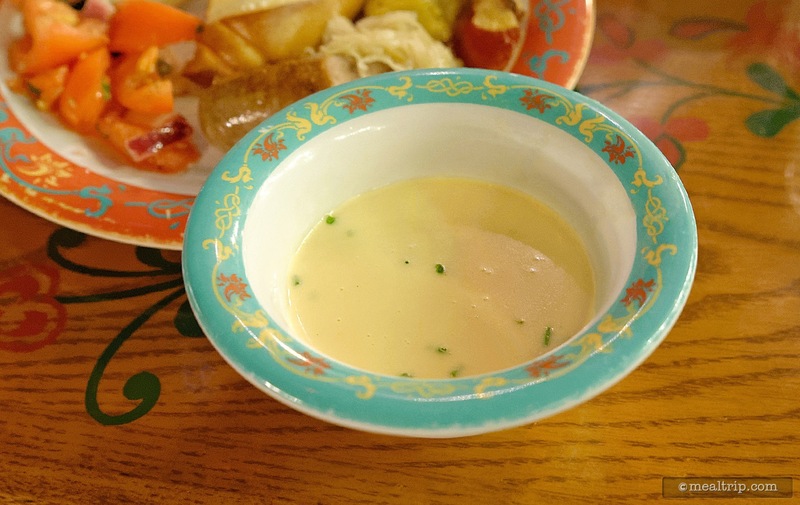 On the day I went, the soup was a potato based beer and cheese soup that was just delicious. So much so, that if it wasn't for needing to take pictures of everything, I would have went back for seconds. The bread basket's main superstar is a warm pretzel bread that shouldn't be missed. They even go great with some of the hot items at the next station. One of the more consistently great things (besides the soup and pretzel bread) at the Biergarten has been the sausages with sauerkraut and a basic herbed roasted potatoes side dish. The hearty combination is exactly what you are looking for to go with that liter of beer. There is a warm Spatzel that is great when it's fresh and a few other German-ish options, such as Beef Rouladen and Sauerbrateen. I say German-ish because an entree like Sauerbrateen was traditionally made with tough meats such as horse or venison and marinated for a couple of days. The Epcot version, is probably pork… but no complaints from me. There are other proteins to choose from such as meatballs in a dark sauce, a white fish and/or salmon, roasted pork and either a rotisserie chicken or breaded chicken patty with various herbed sauces. Toppings include apricot chutney, a couple kinds of mustards, ketchups and an applesauce. A few American-style sides round out this larger "hot food station", like fresh sautéed green beans (which are really quite good), mac and cheese, and some braised cabbage. At the very center of both sides, there is a meat carving station. While I used to think the station was a "dinner only" thing, I have found someone at the carving station during lunch as well. It seems as though a pork roast or something similar is available for lunch, where you may find two or three meats being carved at dinner, including a beef selection. 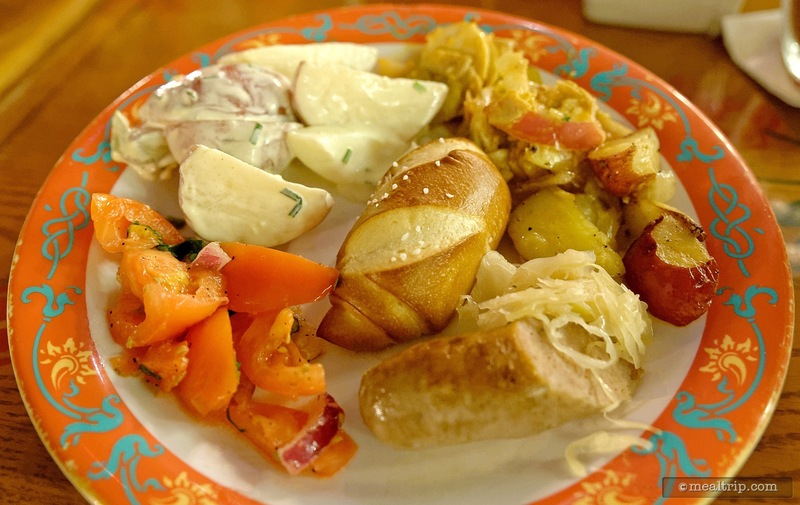 Some would say this isn't really a place for vegetarians, but the prepared salads, pretzel rolls, spaetzle, salmon, and roasted potatoes are all quite good, so you won't go hungry here if there are big meat eaters in your party. As is the case with those guests that need to go gluten-free or that have specific food allergies, there are chefs on hand to point out which items match your particular dietary requirements. 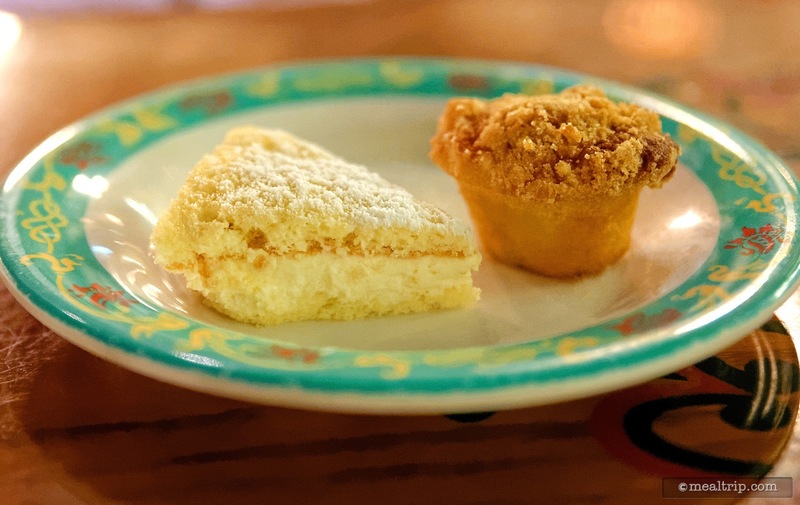 Desserts are not one of the first things that come to mind when talking about German cuisine, but there are a couple of good offerings here as well. If you're looking for rich chocolates or very sweet desserts, you will be disappointed. 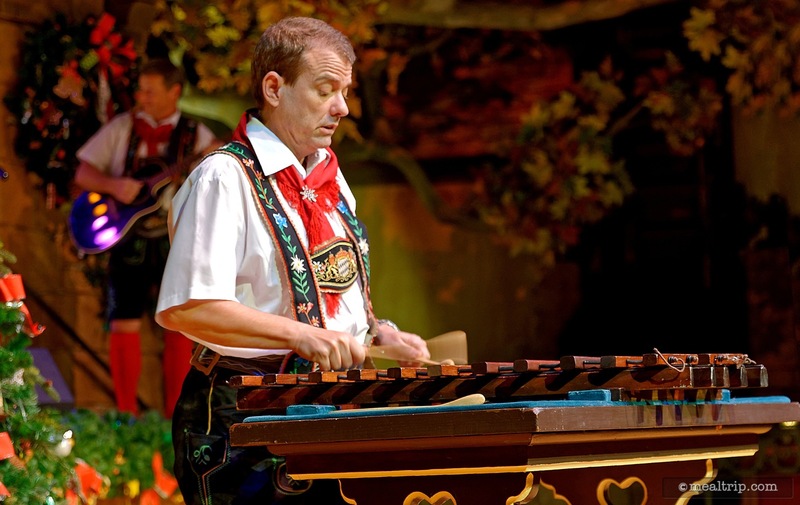 Traditionally, dried fruit breads, heavy creams and natural fruit tend to be considered dessert, and the Biergarten stays very true to that. 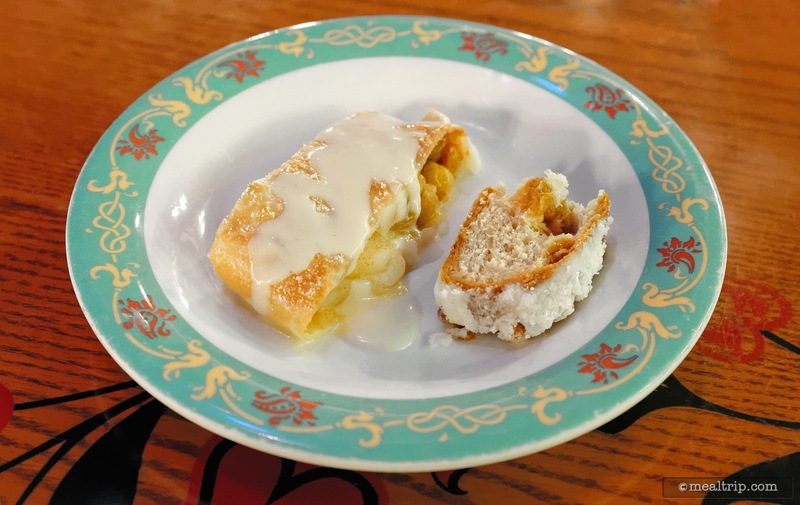 The apple strudel seems to be one of those things everyone gravitates to, and even though it's good, I'm a plain old American caramel apple pie fan, and therefore most strudel's don't live up to the hype. 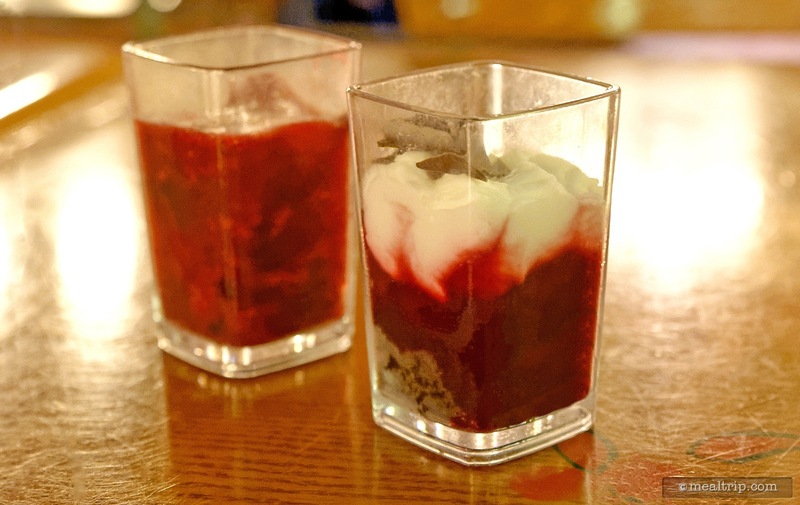 There is usually a bavarian cheesecake, a black forest cake or chocolate mousse (think darker chocolate though, and not the sweet variety), or something that is on, over or under a mixed berry compote. The berries, are super punchy, a little sweet and go great with any cream based dessert. Around the holidays, you might find a traditional stollen cake, and not during the holidays there's a florentine cookie that's quite good as well. 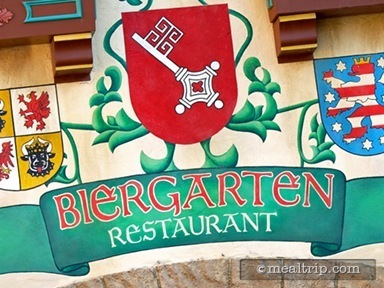 I've always come away from the Biergarten Restaurant thinking it was a good experience, and have been very happy with the food, the beers, and the entertainment, it's the seating arrangement that I really have to be in the mood for. If you are looking for a quiet, out of the way spot where you can relax for an hour while eating… this is not it. If your whole group is up for a communal experience, where you will definitely get to meet a few new people for lunch, it gets a solid recommendation from me. Lunch, is a better value than dinner if you're paying out of pocket. With the exception of one verity of sausage and a couple of carved meats, it's practically the same experience. As I mentioned before though, the band doesn't usually start playing until around 2pm, so plan accordingly if you want to catch the live entertainment. CLICK HERE to view all 20 images in our photo gallery.